“When people talk about the greater efficiency of dictatorships, they are forgetting that a dictatorship is no more likely than a democracy to make a wise decision,” he says. The Chinese government moved quickly to ban lead in petrol, but it also virtually abolished education during a phase of the Cultural Revolution, he says. A democracy could never do that. 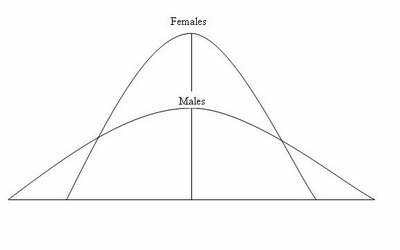 It does appear that on many, many different human attributes-height, weight, propensity for criminality, overall IQ, mathematical ability, scientific ability-there is relatively clear evidence that whatever the difference in means-which can be debated-there is a difference in the standard deviation, and variability of a male and a female population. This entry was posted on 八月 19, 2009, 1:17 下午 and is filed under 国是. You can follow any responses to this entry through RSS 2.0. You can leave a response, or trackback from your own site.